Toyota CEO Akio Toyoda, left, and Mazda CEO Masamichi Kogai signed a long-term partnership to address cost and technical challenges. TOKYO -- Toyota Motor Corp. and Mazda Motor Corp. have agreed to form a “long-term partnership” that deepens collaboration on products, manufacturing and technologies as carmakers race to spread spiraling development costs amid ever-stricter emissions standards. Under the agreement announced May 13, the carmakers will form a joint committee to evaluate “how best to utilize each company’s respective strengths,” the companies said in a statement. The announcement comes amid media reports that said the two companies are exploring numerous projects. Among them would be an arrangement in which Toyota supplies Mazda with its hydrogen fuel cell system and plug-in hybrid technology, in exchange for receiving Mazda’s fuel-efficient Skyactiv gasoline and diesel engine technology. 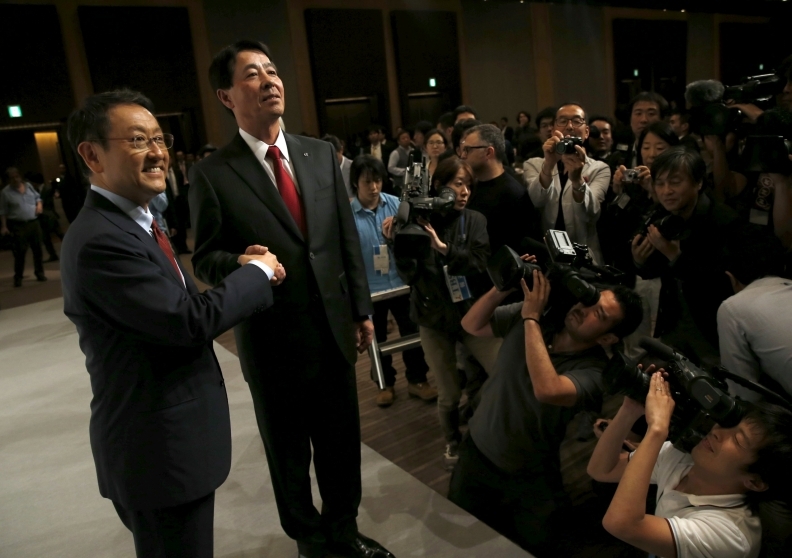 Outlining the partnership at a joint press conference, Toyota CEO Akio Toyoda and Mazda CEO Masamichi Kogai declined to offer concrete examples of what the cooperation might deliver. But they identified joint manufacturing, hybrid vehicles and fuel cells as possibilities. The executives side-stepped questions about the talks evolving into a capital tie-up. They also did not give a timeline for deciding on future joint projects. “This is an engagement announcement, not a marriage announcement,” Toyoda said. The agreement builds upon technical exchanges that date back years between the world’s biggest automaker and one of Japan’s smallest, export-dependent Mazda. Toyota already supplies Mazda with hybrid drivetrain technology for the Mazda3 sedan. And Mazda is building a Skyactiv-equipped subcompact sedan for Scion at its new plant in Mexico. The latest move comes as global automakers increasingly pool resources on expensive green-car development. In hydrogen fuel cell technology, for example, Nissan Motor Co. has teamed with Ford Motor Co. and Daimler AG, while Honda Motor Co. is working with General Motors. Fiat Chrysler Automobiles CEO Sergio Marchionne has vocally advocated for industry consolidation, insisting that major automakers need to stop wasting billions developing the same products and start working together. “The capital consumption rate doesn’t deliver value to the consumer, and in its purest form, is pure economic waste. It’s just bizarre,” Marchionne said last month. In an analysis he titled “Confessions of a Capital Junkie,” Marchionne said automakers could potentially share 40 to 50 percent of vehicle development costs, returning $2.8 billion to $5.1 billion euros of capital every year. For Japan’s smaller carmakers such as Mazda and Subaru-maker Fuji Heavy Industries, circling wagons with a giant like Toyota can complement their own tiny r&d budgets. Fuji Heavy, for example, cooperated with Toyota in developing and manufacturing the BRZ sporty coupe, which is sold as the Scion FRS in the U.S. Fuji Heavy also gets minicars for the Japan market from Toyota Group minivehicle-manufacturer Daihatsu. Toyota also owns a capital stake in Fuji Heavy. “If Ford, Nissan and Daimler need to get together on fuel cells, then Mazda’s not exactly able to go it alone,” said Kurt Sanger, an auto analyst with Deutsche Securities Japan. The incremental volume Toyota can glean from selling fuel cell and plug-in hybrid systems to Mazda and others may help to boost scale and bring down manufacturing costs. Kogai, keenly aware of his small company’s budget limitations, has made partnering with other carmakers a top priority. Besides producing the upcoming Mazda2-based Scion sedan for Toyota, Mazda will also provide a version of its MX-5 Miata roadster to Fiat. Kogai said the Fiat supply arrangement will continue as planned, as will other partnerships already on the books. The need for assistance is especially acute at Mazda following it independence from Ford, which had long been Mazda’s sugar daddy, helping defer global r&d costs. While Mazda has said it has no interest in another capital tie-up, such as that with Ford, it still needs plenty of cash. Even without costly hybrid or hydrogen development, Mazda eyes its own moonshot next-generation drivetrain technology with a 2020 horizon. That strategy calls for introducing homogeneous charge compression ignition, known as HCCI. The technology compresses the fuel-air mixture to such a high pressure and temperature that it ignites by itself without requiring a spark, similar to the way a diesel engine operates. The new gasoline engine under development would be 30 percent more efficient than the Skyactiv powerplants that first debuted in 2011 and are still being spread across Mazda’s lineup. For Toyota, the deal also gives it a front-row seat to study Mazda. Toyota engineers say privately that their company has been quietly benchmarking the comparatively tiny Japanese rival, fascinated by its uncanny ability to churn out high-quality vehicles on a shoestring budget -- and to do so profitably from high-cost Japan. Toyoda said that despite the difference in size between the two companies, Toyota has much to learn from its pint-sized counterpart. “In a sense, Mazda is ahead of us in many areas,” he said. Mazda’s high-compression Skyactiv engines, efficient transmission and lightweight chassis systems, as well as its Kodo design language, are prime examples of areas where Mazda leads Toyota by a “full lap,” Toyoda said. Toyota aims to change that, however, with a new modularized product platform that debuts later this year and will underpin future cars. It is also playing catch up in engines. Toyota had long prioritized gasoline-electric hybrid drivetrains over traditional internal combustion systems. But it now is revamping base engines across the lineup. The new technologies draw on direct injection, turbocharging, high compression ratios and lean-burning Atkinson-cycle combustion. Last month, Toyota said it was stepping up a global engine upgrade of 14 high-efficiency engines through 2015 with the deployment of a new downsized turbo unit.